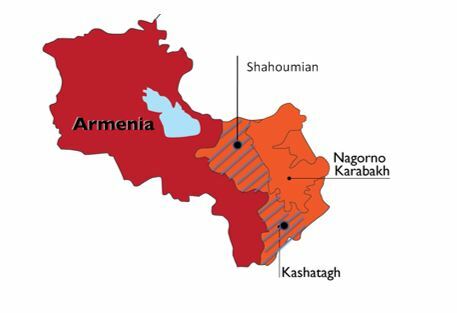 The Kashatagh and Shahoumyan regions of the Nagorno-Karabagh Republic (NKR/Artsakh) have a strategic importance, as they bind Artsakh to Armenia (see map) and are thus vitally important for the long-term existence of the homeland of Armenians. Without these two regions, it is only a matter of time before we lose Artsakh. Without Artsakh, Armenia will not be a viable country both strategically and economically. In 2008, a conference was held in Pertsor (Latchin) that was sponsored by the government of Artsakh and facilitated by the Tufenkian Foundation (an NGO established by James Tufenkian of New York). The objective was to develop a plan to quickly repopulate the Kashatagh region of Artsakh. Attended by a large number of organizations from Armenia and the diaspora, the conference stressed the importance of Kashatagh, and hence the urgent need to repopulate the region if we want to keep the land. – If you want to populate a region, you have to create jobs. – If you want to create jobs, you have to invest (charity is commendable, but does not energize the economy). Kashatagh and Shahoumyan are predominantly agricultural, with Alpian pastures, fertile land, plenty of water, and a favorable climate. They have the potential to become the food basket of not only Artsakh but also the Republic of Armenia. Therefore, ARI decided to start its investments by supporting agriculture. ARI was registered as a company in Cyprus in 2010. Its mission is to contribute to the sustainable development of the Kashatagh and Shahoumyan regions by investing in profitable projects and optimizing shareholders’ return on investment (ROI). Its vision is to become the leading international investment company for the development of the two regions in Artsakh. ARI’s initial number of shareholders of 16 has, over the course of 4 years, grown to 150, mostly businessmen. This is a unique phenomenon in the history of the diaspora—150 businessmen joining hands in nation building. ARI’s mission is to contribute to the sustainable development of the Kashatagh and Shahoumyan regions. – ARI’s shareholders lend a minimum of $25,000 to ARI under a 3-year loan agreement, with 6-percent interest paid to shareholders annually, shortly after the close of the fiscal year on Dec. 31. – ARI lends to Agrofund (a fund wholly owned by the government of Artsakh) in lots of $100,000, at 9 percent for periods of 3 years. The loans are governed by a loan agreement made under Cyprus law. – The difference between ARI revenue and cost (9 percent – 6 percent = 3 percent) covers ARI’s overhead (Cyprus brass plate address, legal fees, audit fees, monitoring expenses, bank charges, and other expenses). – Agrofund’s loan agreement is guaranteed by the government of Artsakh, a signatory to the triangular agreement. – Agrofund (a government fund/institution that supports agriculture and rural development) lends to farmers amounts varying between $3,000 to 3,500 at 6 percent interest. The difference between Agrofund’s revenue and cost (9 percent – 6 percent = 3 percent) is subsidized by the government. – Farmers submit their “request for loan” applications to Agrofund, giving full details including the purpose for which the loan is required. – Agrofund reviews the applications and sends to ARI batches of around 30 accepted applications (totaling around $100,000). – ARI transfers this amount to Agrofund. – Every summer, ARI sends a team to monitor the work of Agrofund to ensure that the amounts lent to Agrofund have reached the farmers and have been spent by the latter in accordance with the “request for loan” applications. ARI’s working capital has grown from $300,000 to over $3,500,000. The following are the operational results through the end of 2014. ARI’s working capital has grown from $300,000 to over $3,500,000. – The government is happy, because it could not have borrowed at such favorable terms from the banking sector. – The farming community is very happy, because they finally have access to capital, which enables them to build their businesses. – The shareholders of ARI are happy, because they are investing at a return that is far better than bank deposit interest, but more importantly, they are contributing towards nation-building. In addition to providing capital and thereby work to the population, ARI has embarked on a new project to finance the construction of houses. Plans were drafted for a model village of 150 houses, to be built in 3 phases of 50 houses each. Work started in 2014 on the first 50 houses and will be completed in early spring of 2016. The village, called Ariavan, straddles the banks of the Aghavnou River. In addition to providing capital and thereby work to the population, ARI has embarked on a new project to finance the construction of houses. ARI’s model has been a successful way to develop a sustainable economy. To bring about more rapid economic growth and make a substantial difference in the region, ARI needs to grow. This will be possible if all Armenian communities in the diaspora are involved. ARI’s model has been a successful way to develop a sustainable economy.